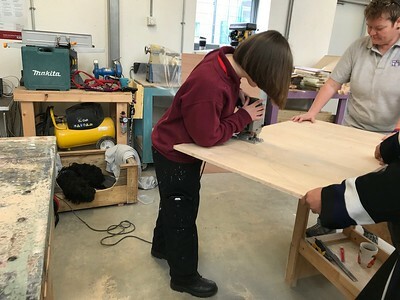 Oakleaf carpentry apprentice, Anna Brickstock, represented The Community Housing Group at a recent event held by Fortis Living at Warndon Community Centre in Worcester, where she was demonstrating her skills to other women. The event was promoted as a “Try a Trade Day” which was predominantly aimed at attracting more women to consider trades as a career option, which are traditionally thought of as a man’s function. Jobs such as plumbing, carpentry, electrics as well as painting and decorating are rewarding occupations and there are many more women who are finding the challenge and job satisfaction in the skilled trades. Whether a school leaver looking for an Apprenticeship or simply an adult wanting a career change, they are now considered as rewarding career options and we are keen to see more women entering the building trade.